The national disability charity, United Response, has published an easy read summary of the European and local elections today. Using simple words and images, the publication aims to make the voting results more accessible to the 1.5 million people with learning disabilities in the UK. The summary has been published as a special edition of Easy News, a free accessible news magazine launched by United Response last year to make news easier to understand for people with learning disabilities. The magazine is produced by UR Consultants, a group of people with learning disabilities, supported by United Response. 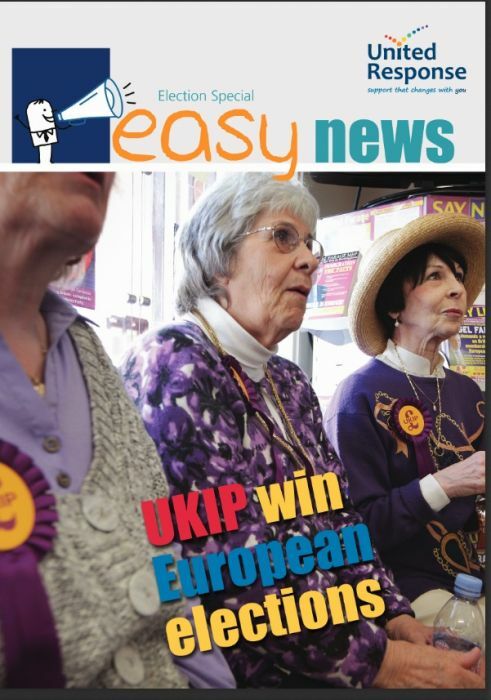 A bi-monthly magazine, Easy News was created to make the events in the news and political debate more accessible, and so make it easier for people with learning disabilities to follow developments and express their opinions. Most people with learning disabilities are eligible to vote, yet turnout at elections remains incredibly low, as has been shown through figures from United Response’s Every Vote Counts campaign, which found that as few as 16 per cent of those with learning disabilities who were registered to vote actually did so in the last general election; a stark contrast to the national turnout of 61 per cent. United Response hopes that Easy News will help people to become better informed by encouraging debate around the issues covered in the magazine, and so make voting more relevant to people’s lives. When United Response first launched Easy News, it asked readers if they felt that politics made a difference to their lives. Back then, only 31 per cent felt that politics did make a difference. A year on and the figure has risen to 78 per cent – a 150 per cent increase. At the same time, 90 per cent of readers have said that they find Easy News easier to understand that other newspapers or news on TV. This suggests that a greater understanding of the basic workings of politics and news within the political system breeds greater enthusiasm for political involvement. High performance athletes join UK Sports Association’s My Sport, My Voice! Be the first to comment on "Disability charity publishes Easy Read summary of European and local elections"